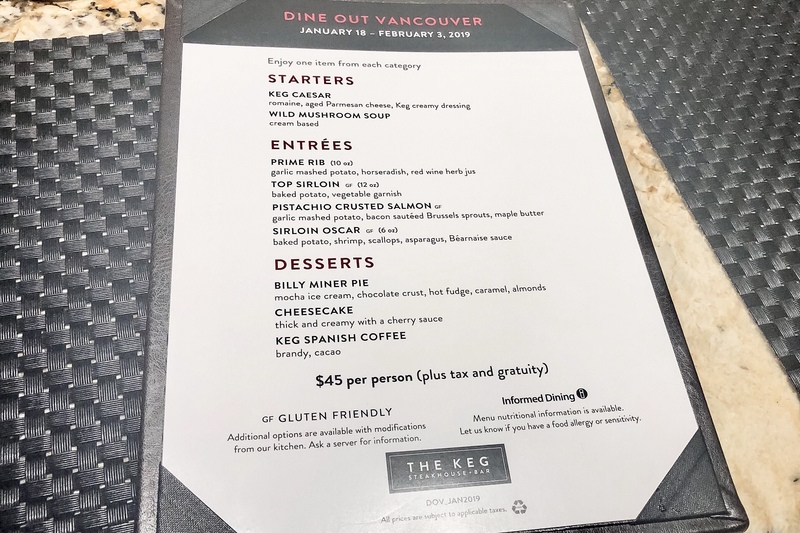 The Keg Yaletown is a favorite spot of my friends Steve and Martin, the fun and hilarious duo. They are the regulars downstairs sitting by the bar and enjoying their steaks and drinks. Today I happened to be joining them for dinner and we decided to try the Dine Out Vancouver Festival (DOVF) deal. 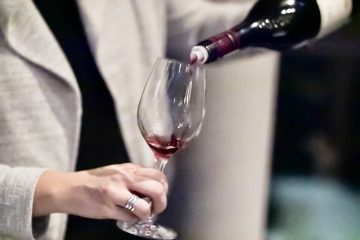 Although this year the price is a bit higher at $45, but they seem to offer the large-sized steaks on the menu, such as the 10-oz Prime Rib ($32) or the 12-oz Top Sirloin ($33). 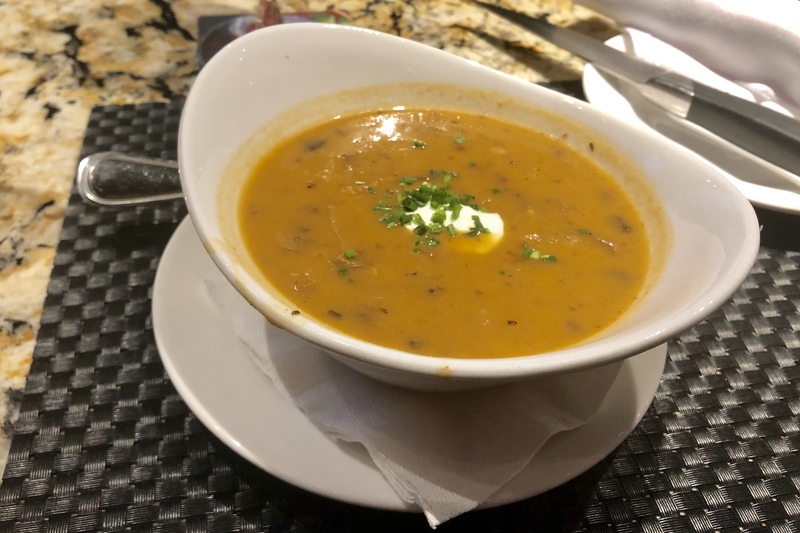 Most of the dishes on the Dine Out menu are on their regular menu, which is respectable and the kind of deal I prefer over the ones with special dishes designed just for the Dine Out menu at a lot of other restaurants. However, there is one dish that’s offered here only during the Dine Out fest, the Wild Mushroom Soup. While Martin said it was the best mushroom soups he had ever had, I found it pretty close too for myself. The assorted wild mushrooms were properly dealt – there was no bitterness or ugly greyish colour. The amount of cream added was perfect, it was luscious but the creaminess was on the light side. And the umami mushroom flavour was incredible. For the main course, I went for the big one, the 12-oz Top Sirloin served rare. I always prefer the texture and the bigger flavours of sirloin steaks. 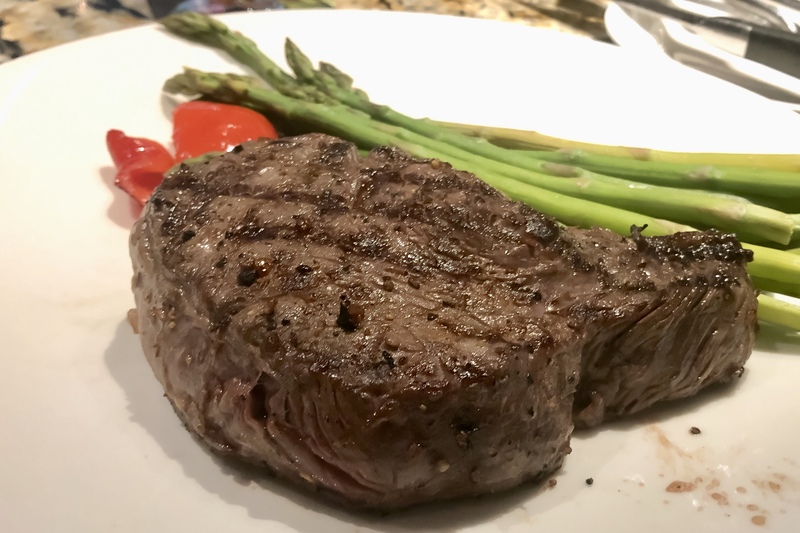 But today having the steak with rare doneness, cutting through the steak was like cutting through butter, and it felt like eating tenderloin in my mouth – something they must have done right during the aging process. So if you don’t mind having it rare, should definitely go for the 12-oz! I really wish they had spent a bit more effort on the steamed asparagus though. But this seems like what The Keg has been doing for years. Martin ordered the Sirloin Oscar for the main of the Dine Out menu. 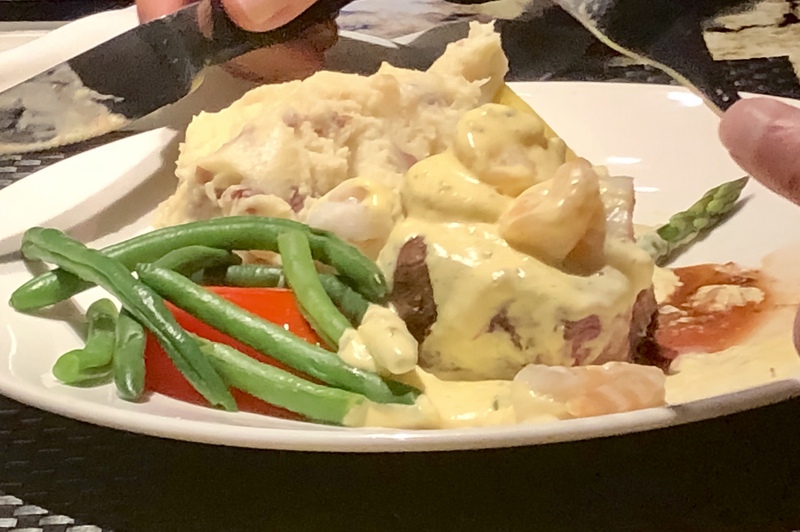 The 6-oz steak was topped with shrimps and scallops, a decent choice for the fans of surf-and-turf. I was surprised how good my dessert was. 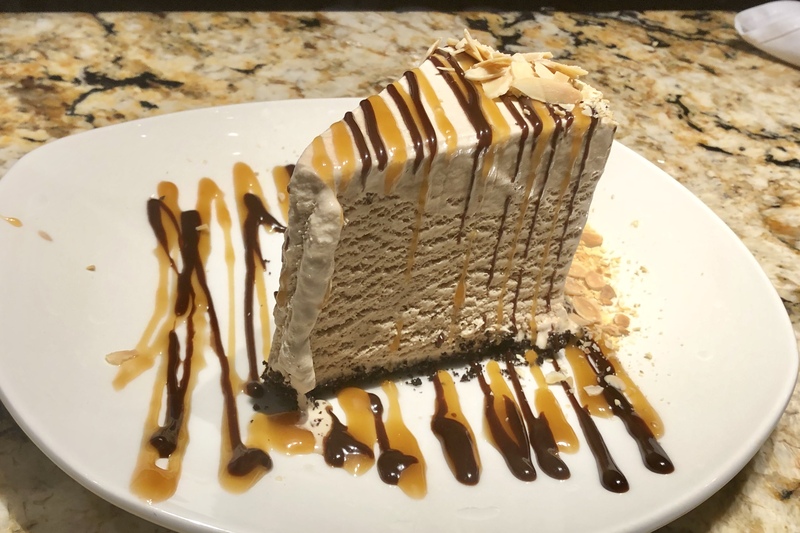 The Billy Minder Pie was actually a large slice of mocha ice cream cake with a chocolate crust, painted with fudge, caramel, and almonds. The combination of ingredients sounds like a classic decadent one, but it is not heavy at all, perfect after such a big piece of steak. 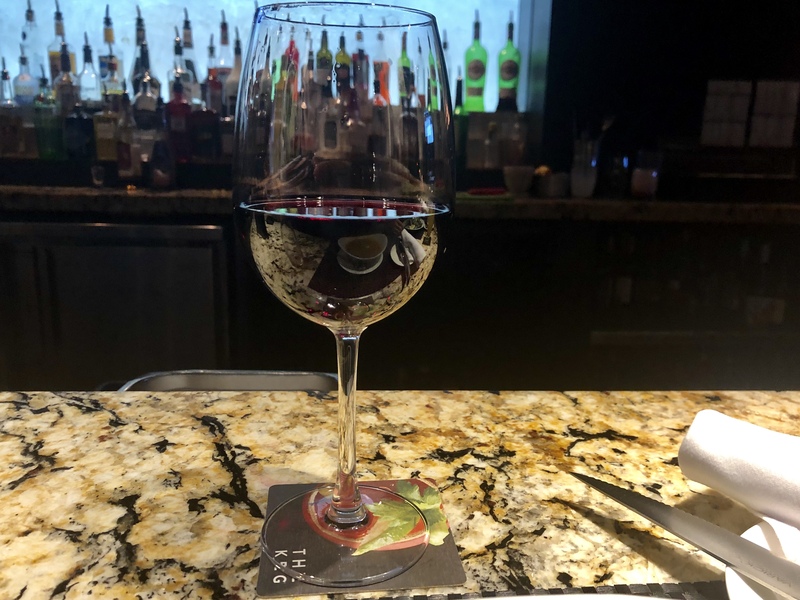 My favourite wine at the Keg is always the Quail’s Gate Pinot Noir, a lighter red with such elegant flavours and a clean finish, good for pairing with almost anything and even just bar drinking. I always recommend The KEG if I have any visiting international guests. We might not have a lot of distinctive Candian dishes here, but at least we have the amazing Canadian beef that we are super proud of. And for a satisfying steak dinner, The KEG does it right with affordable prices. As for the Dine Out menu, there are no tricks here because most of the dishes are on their regular menu. However, the only Dine-Out item, the Wild Mushroom Soup, is incredibly delicious, something I wish they had offered in their regular menu.